Diamond Jim Brady was just one of many colorful characters running around Saratoga at the turn of the century. He was a wealthy businessman, and was known just as much for his large appetite as he was for his money. Born in 1856, James Buchanan Brady worked his way up through the ranks of the New York Central Railroad system starting as a bellboy and eventually becoming the general manger. Later, he transferred all the knowledge he had gained in the railway industry to become a salesman for railroad supply company, Manning, Maxwell and Moore. Brady later joined Pressed Steel Car Company. As his wealth accumlated, Brady became known for his love of jewels, especially diamonds, and hence was known in popular societies as Diamond Jim. His massive wealth and love of gems certainly came in handy when spending time with extravagant actress Lillian Russell. Both of them could eat mounds of food for every meal, and were said to have complemented each other perfectly. 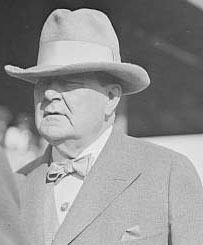 Diamond Jim Brady was a frequent visitor to Saratoga Springs, spending the days at the racetrack or the casino, and spending the night at parties of the Gilded Age. He made his first appearance in Spa City with Russell in 1882. Brady is also remembered as a philanthropist. Upon his death in 1917, he donated most of his fortune to medical institutions. Today, Saratoga Springs regards him as one of the great luminaries of society that wined and dined in Saratoga during the Gilded Age.